Yesterday, Londoners were treated to a taste of what it’s like to cross the streets of Tokyo. 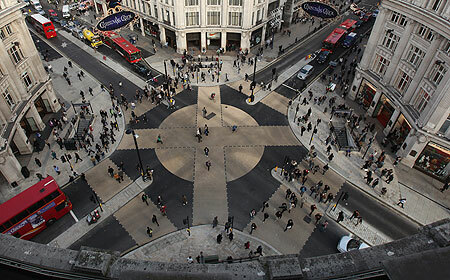 Oxford Circus, which is considered to be the “heart of London’s West End shopping and entertainment district,” opened the first ever Tokyo-style pedestrian crossing in their part of the world. The style of this pedestrian crossing – as you can see from the photo, courtesy of Mirror.co.uk – allows people to cross the intersection diagonally, on top of being able to cross in straight lines. Obviously, in order for this scheme to work, traffic in all directions must be halted all at once to give way to the pedestrians. Indeed, why haven’t others thought of this before? Trust the Japanese to come up with such a simple solution to a simple problem!